Need to resize partition without reformatting disk? Try IM-Magic Partition Resizer Pro to resize partition spaces without reformatting disk, reinstalling OS, or even trouble yourself moving large data from one place to another. 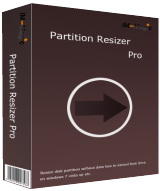 Partition Resizer Pro developed by IM-Magic Inc. is 100% safe for resizing, redistributing disk space plus its extremely easy to understand interface. It works on Windows 10, 8,7, Vista and XP All editions. NB: Lifetime license; no commercial use; no update.